New Delhi, March 22: The Indian Premier League (IPL) is back and the 12th edition of the cash-rich league couldn't have hoped for a better start as defending champions Chennai Super Kings (CSK) are all set to take on the star-studded Royal Challengers Bangalore (RCB) in the opening game at the MA Chidambaram Stadium in Chennai on Saturday. Cricket might be a team game, but come Saturday, it will be all about CSK skipper Mahendra Singh Dhoni versus Virat Kohli, captain of the RCB. 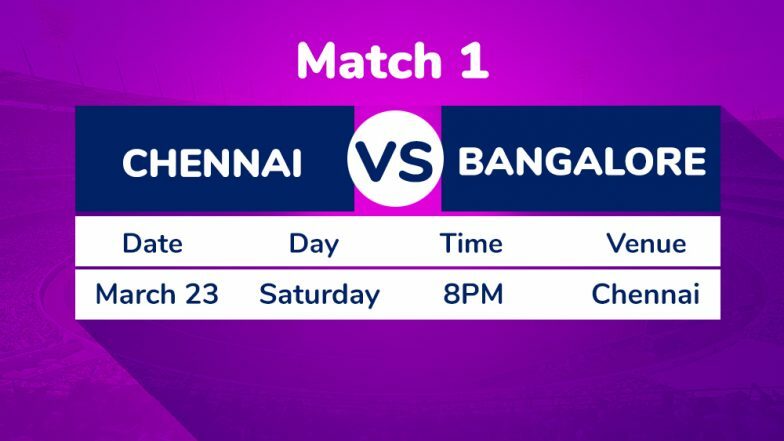 Chennai Super Kings vs Royal Challengers Bangalore Live Cricket Score 1st T20 Match. He might be the former skipper of the Indian team, but for his legion of fans, Dhoni is no less than god. Add to that the home factor, and there are no points for guessing that Chennai will be all yellow on the night of the opening game. Kohli, on the other hand, might be a demi-god himself for his fans, but when it comes to fighting it out against Dhoni, he might just come out second best. CSK Team in IPL 2019: Schedule and Squad Analysis of Chennai Super Kings in VIVO Indian Premier League 12. For the record, RCB have lost six of the seven games they have played so far at the Chidambaram Stadium and the numbers are again pitted heavily in favour of CSK. Overall, in 22 meetings between CSK and RCB, the Bengaluru outfit have managed only seven victories. In fact, the last time these two teams met -- in Pune last season -- Chennai were all over Bengaluru and it was a cakewalk for Dhoni's boys. But a lot has changed since then and the senior most team in the IPL -- CSK -- have grown a year older. RCB Team in IPL 2019: Schedule and Squad Analysis of Royal Challengers Bangalore in VIVO Indian Premier League 12. The positive for RCB is the fact that AB de Villiers is fit and raring to go after resting his back during the last stretch of the Pakistan Super League (PSL). They also have a young power hitter in Shimron Hetmyer of the West Indies to add to the arsenal. But CSK have the experience to tackle the swashbuckling batsmen in the RCB ranks. If Harbhajan Singh was the stand-out bowler for CSK last season, Deepak Chahar too showed great maturity to earn an India cap on the basis of his IPL performance. Not to forget the tactical acumen of part-time spinner Suresh Raina and Kedar Jadhav. In the batting department too, if RCB have a run-machine in Kohli, Dhoni too is coming on the back of an outstanding previous season when he showed why he is still one of the best in the business. In fact, Dhoni has scored 710 runs against the RCB, the most by any batsman against the franchise. The IPL might not have an opening ceremony this time around as the fund budgeted for the same is being handed over to the families of the Pulwama martyrs, but one couldn't have asked for a more blockbuster start to the 12th edition of one of the most followed domestic T20 leagues in the world.